Have you ever fancied Ski Touring? skiing across open country, walking uphill on skis as well as skiing downhill. “If you dream of leaving the behind the crowds and carving fresh tracks on virgin snow - then our beginner ski tour course if for you. This is for keen skiers with some off piste experience"
Now you can try your hand at ski touring this April, it is the perfect time of year to experience it. Try ski touring with Alpine Actions Resort Director Iain Macluskie. Ski Touring is for those who appreciate gaining altitude, in search of the perfect downhill run under their own steam. Ski touring can get you into areas considered inaccessible to ordinary skiers and offers a completely different mountain experience. It is one of the most fashionable aspects of skiing at the moment. Imagine gliding along or steadily climbing up pristine snow! It doesn’t have to extreme. The touring scene is full of health conscious adults and there is no age limit. There are several benefits, high calorie burning. That helps with the mountain lunches too. Access to the most beautiful skiing for the advanced skiers. The less experienced can walk up suitable terrain and easily ski back to the piste. · Lunches & drinks during the day. To Orelle and back from Meribel from Alpine Action on Vimeo. With a lifetime of experience and 30 winter season in Meribel and other resorts in other Europe, North America and New Zealand. Skiing and now teaching/guiding has been his whole life. As well as being the Alpine Action Resort Director for over 10 season, he is also an ESF Meribel (Ecole du Ski Francais) fully qualified instructor. 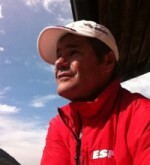 His speciality is private teaching, guiding and ski touring. He is best at off piste adventures throughout the Three Valleys with lunch stops to suit all group tastes. There not much this man doesn't know about skiing in the Three Valleys or where is best to eat. Skiing during this week with him will be an experience you will not forget. Day 1 Arrive in resort, welcomed into your chalet for afternoon tea. Then equipment hire & passes are sorted. Meet your guides for an introduction, with a Q & A and safety talks. Day 2 First day on the slopes, guided ski and warm up. Day 3 Your first ski tour day. Day 6 Your last day of free skiing and de-brief. The warm up and touring session are approximately 3 hours. The itinerary may change with weather conditions. Ski carriage is £48 per bag return / Single room supplement £299.